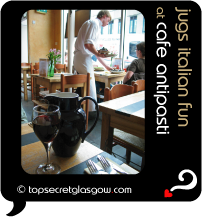 Cafe Antipasti West End, on Byres Road has been keeping the locals happy for years. And why not? The best of Italian cuisine, in a laid back restaurant with a friendly, buzzing feel that works every time. While away the time over toasted bruschetta, or sip a Peroni over some divine garlic Italian flat-bread, and watch the best of the West End pass outside the huge windows. Or go for broke with your choice from maybe the best risotto in town, and the most hearty chicken cooked with asparagus, gnocchi in a white wine cream sauce. Divine! Great news! Finding this page means you can now join our VIP list for Cafe Antipasti West End. Grab your very own web page all about Cafe Antipasti West End. Do you have a special story about Cafe Antipasti West End? A funny experience? A grand occasion? A funky photo? A personal tip? A top secret?